Do you have a pergola in your backyard? Are you thinking of installing one? Would you like to use your pergola for more than just decoration? If you’re looking for information about how to improve your backyard pergola, look no further than the information below! In this article, we’ll show you five different retractable sun shades for pergolas that are sure to make your backyard experience better than ever before. Your pergola will become a great pseudo-gazebo immediately. With a shaded cover, you’ll want to sit beneath it rather than letting it just stand there in your yard without much of a purpose. You can grow tender plants under your pergola. Many people enjoy growing plants up and over a pergola, and with a shade in place, this will be easier than ever before—even if you’re starting young new plants that need some additional shade for protection. Your yard will look more elegant with a shade on your pergola. This will make the overall aesthetic appearance of your backyard space better than ever before, and you’re sure to love the stylish look your yard will take on when you have one of these in place. Whatever your reason might be, check out our list below to help you find the perfect pergola shade in no time. With the Palm Springs Steel Pergola with Retractable Canopy, you can have your pergola and canopy all in one easy-to-use product! 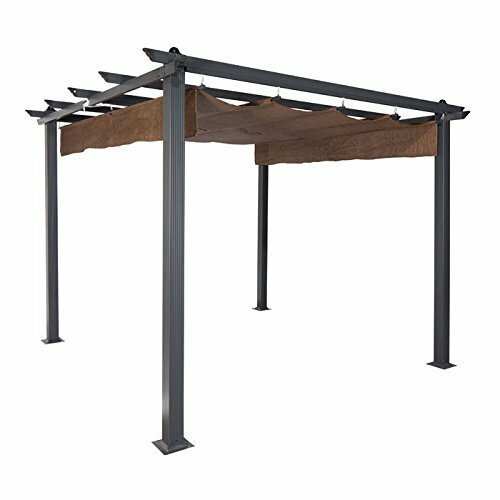 This pergola is made of powder-coated steel and features a UPF50+ canopy that can be retracted as needed when the weather gets bad. The shade is very comfortable under this canopied pergola. When installed, this is a very elegant and aesthetically pleasing product with a great look for any backyard. The pergola itself tips over easily if it isn’t held down well. The included directions are very challenging to follow and you will need help. Check out the ALEKO Aluminum Outdoor Canopy Pergola when you’re looking for a great 9’x9’ product that can handle a lot of wear and tear. 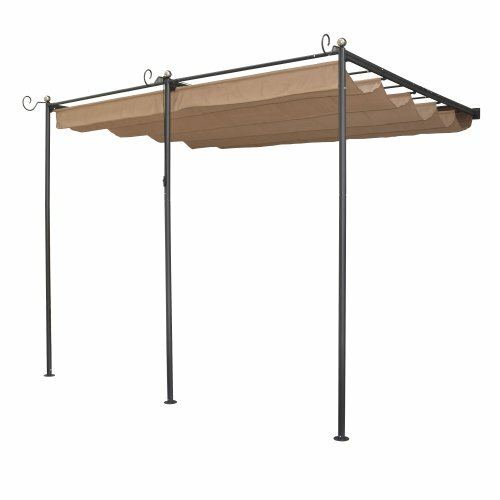 This canopy is easy to put up in place and comes with everything you need to hang it and get it ready for use right out of the box. The canopy is a nice neutral color that fits in well with just about any type of backyard decor. The product is durable enough to leave up during most weather, excluding storms and snow. The fabric on this canopy is not as waterproof as some others listed here. The product may be missing some required pieces on arrival. Choose the Sunjoy Large Naples Pergola canopy when you have a 10’x8’ pergola in need of a high-quality and durable canopy cover. This canopy is retractable and easy to install and take down as needed when the weather changes. This product is lightweight and easy to hang up and operate without help. The fabric is very thick and durable for years of use. The canopy portion of this product is not designed to be waterproof and should be removed or closed when it rains. The included directions are very difficult to follow. When you want a durable wall-mounted pergola-style canopy for a smaller backyard space, the Bosmere Wall-Mounted Steel Sun Canopy with Retractable Fabric is the way to go. 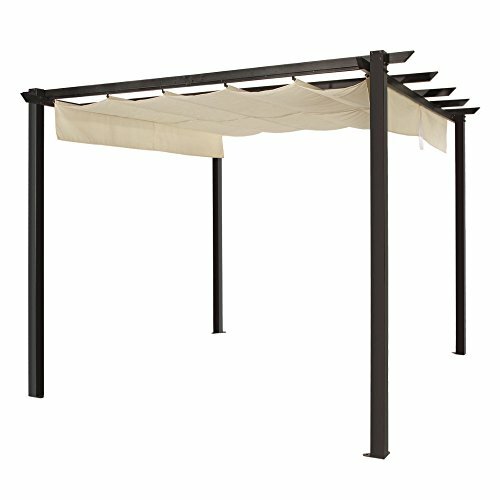 This canopy shade is waterproof and comes with a sturdy steel frame in the event you don’t have a pergola already installed in your backyard. This frame can be adjusted to several different heights, and the product comes with everything you need to get it installed and ready to go in no time. This product is very easy to set up and put in place in no time. The canvas is easy to keep clean and the frame itself can be opened and closed as needed. In some situations, the product may arrive with some damaged or incorrect pieces that make installation difficult. The canopy will hold rain and should be closed during weather events. 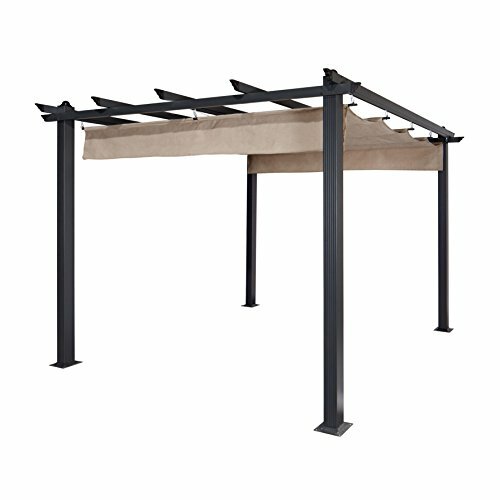 If you’re looking for a cover for your 9’x9’ pergola, check out the Colorado Constantine Pergola cover. This cover, available in three different colors, is designed to block up to 90% of UV rays all while keeping it much cooler beneath the shade than the outside temperature. The cover features a lightweight frame and is very easy to keep clean and maintained throughout the life of the product. 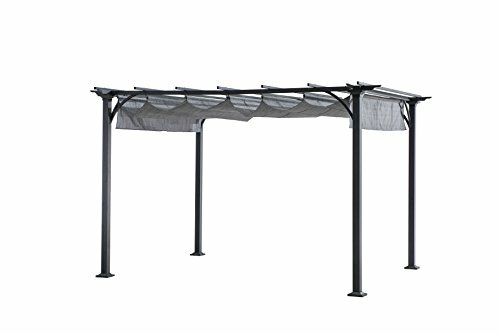 This is a frame and sun shade cover together, so when you purchase this product, you’re getting everything you need—including the pergola itself! This product is very easy to set up and get put in place in no time, with or without help or experience. The cover on this pergola may rattle and move around a lot in the wind, even when it’s not very strong. The canopy portion of this pergola cannot stand up to the weight of snow and ice and must be removed during the winter months if this is a risk where you live. Did you find a shade that will work for your pergola from our list above? There are a lot of good options out there, so take your time and consider the products we have reviewed for you. You’re sure to find something that will work well and look beautiful at the same time, and you may even want to encourage other people in your family to bring home a shade for their pergolas too! But can this be more of an investment than you really want to make? Are you going to have to replace the whole cover when it eventually breaks or becomes damaged? In short, no—if the fabric on the shade cover for your pergola tears or becomes otherwise no longer usable, you can replace the fabric portion alone and leave up the rest of the shade. You’ll only need to replace the whole thing if the mechanism in the shade itself stops working. In the end, a shade cover for your pergola is sure to give you tons of benefits without too many risks. So what do you think? Are you ready to install yours right away?